Pink Lady's Licorice Bullets are smothered in fine, milk chocolate. Buy in bulk and save - ideal for your next big celebration! INGREDIENTS: Milk Chocolate (40%) [Sugar, Cocoa Butter, Whole Milk Powder, Cocoa Mass, Skim Milk Powder, Emulsifiers (Soy Lecithin 476), Flavour (Vanilla)]. 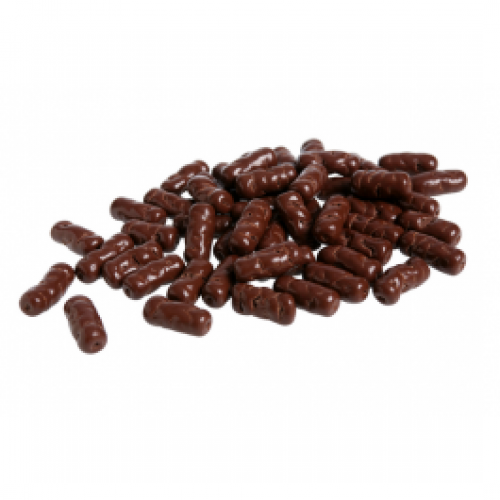 Licorice (60%) [Molasses, Wheat Flour, Sugar, Wheat Glucose Syrup, Colour (150c), Vegetable Fat, Licorice Extract (2%), Flavours, Emulsifiers (471), Preservative (200), Salt] Glazing Agents (414, 904). Milk Chocolate contains a minimum of 34% Cocoa Solids and a minimum of 27% Milk Solids.